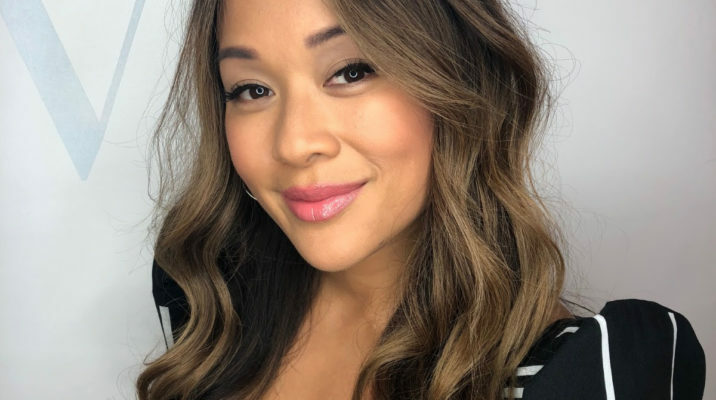 As an on-air hair expert featured regularly on the Marilyn Denis show and the proud supplier of the Toronto Raptor’s North Side Dance Crew, Loriebelle Nestor is the woman at the helm of Hairlove by LB Hair. Read on to learn how this brave mama battled the lesser-known “Pre-Partum” depression and picked herself up to be at the top of her game. My name is Loriebelle “LB” Nestor—I am a mother of a beautiful and talented 3 year-old Nyla, a wife and a salon business owner with my partner in life, my husband Nick. I am the lead Master Stylist, Owner and Operator of HAIRLOVE BY LBHAIR (opened in October, 2016) and Hair Expert on the Marilyn Denis show. I started doing hair in my parent’s basement in Winnipeg, Manitoba at the age of 15. Years later in 2006, following a leap of faith, I moved to Toronto, leaving behind a huge Filipino family, full clientele and the #1 salon in Winnipeg. I essentially had to start my career over, once again building a clientele and really hustling hard to put myself out there. After six years in Yorkville, I built a strong client base, became a member of the Toronto Fashion week Team, and had competed in endless hair competitions. I started feeling suffocated as a stylist, with no freedom to explore and grow. It was then that I left to start my own independent business LBHAIR. I rented a shared studio space in the heart of the Fashion District at Richmond and Spadina where I then landed the incredible opportunity to freelance with the Marilyn Denis Show, which later evolved into becoming one of their on-air hair experts. As this was all happening, Nick landed a promotion with his Dream company, NIKE—but there was a catch—the position was in Montreal. We both decided that we needed to chase our dreams, even if it meant we would be cities apart. We knew it wasn’t going to be easy but knew what we had was solid. This separation ended up lasting three years longer than we had planned, but we made it through and ended up getting married and soon after had a beautiful daughter. After our daughter turned one, we decided to take a risk and start our own business. Together, Nick and I opened HAIRLOVE BY LBHAIR, a passion project we’d always dreamed of. Not just amazing hair, but great vibes with talented hairstylists who truly wanted to make a difference—a team-based studio run by real Family values that catered to a larger crowd that builds community. I remember being in Winnipeg and being the first Filipino to land a job at the Prestigious Edward Carriere salon. I remember telling my father that I wasn’t going just do hair: I will make a business out of it. I am inspired by my family—my parents who are the most humble, loyal and hardworking people whose main purpose is to provide for their family. I am inspired by my husband who was raised by a single mother who had twins and worked hard to instill strong values and strong will in him. I am inspired by my daughter each day as her coming into this world was the biggest life lesson and teacher everyday. I am inspired by my fellow hairstylists that dream to do more. What are your favourite career/business moments? Starting LBHAIR—my first independent business. This was also one of scariest moments! Opening up HAIRLOVE—it was truly a labour of love and I still look back at when this was only a daydream for all of us. HAIRLOVE is the proud supplier of the Toronto Raptor’s North Side dance crew and is 5-star rated. When we hear that people travel hours from all areas of Ontario to come see us and spend time with us, is the true reward. What was the biggest career challenge you faced? 2014 was one of the best but also hardest years of my life. Just when everything I’ve ever wanted, worked for and dreamt of was happening—career high, full-time clientele, back-to-back TV appearances, engaged and planning a dream destination wedding AND also expecting our first child— this simultaneously caused a lot of pressure and created and anxiety I couldn’t control. I discovered that I suffered from “Pre-Partum Depression”, which happens to only 10-15% of pregnant women (this is far less likely to be properly diagnosed or treated than Post-Partum Depression). I felt like I couldn’t face anyone or talk about it and was upset with myself that I couldn’t handle it all. Mental Health has many faces and at this point I could not recognize mine. Doctors ordered me to stop working, to give up my TV appearances, cancel all my clients and even weddings that summer. I had this overwhelming feeling that I was letting a lot of people down. I was in a very dark place for a few months but Nick, my family and closest girlfriends were truly the ones who picked me up from the bottom. I know as women we have many roles and we wear it with pride: mothers, daughters, sisters, wives, entrepreneurs and don’t forget SELF. And sometimes breaking points happen to remind us to stop, slow down and take time to work on your SELF, your health, wellness, mind, body and soul to strengthen yourself before taking over the world! Personal development is constant. I believe in inner work, self-work, and I will forever be a student and evolving as a human being in each role I have in Life. I’ve been reading self-development books since I was a teenager because growth and inner work has always been a part of my spiritual being. I start every new year with something new for me to learn, whether it’s a physical class, a mindful practice or a new course or a combination of all three. Never give up. Take big risks. Write to yourself and work on yourself. Know your why. Take time for yourself—even if it’s an hour a day—to step away from all the responsibilities that you put before you and know that you need to attend to you mind, body and soul before taking care of anything or anyone else.